The Thursday Interview: Chris Tetreault-Blay. Today, I'd like to welcome Chris Tetreault-Blay, author of “Acolyte” to The Thursday Interview. Before we get started, a quick intro! “Basingstoke-born and Devon-raised” is how he describes himself. Chris moved from town to country life in 2005 after graduating from Staffordshire University, where he currently resides with his wife and twin children. 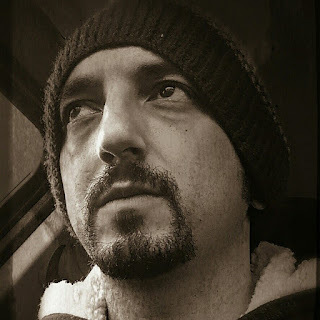 Chris is driven by everything horror – which has translated into his work so far, as well as being passionate about local Devon history and folklore. His writing journey only started as recently as 2013 when he first dabbled with short fiction. Chris cites James Herbert, Dean Koontz and Rob Zombie as his horror heroes, and is also a huge heavy metal and British folk music fan and self-taught guitarist. Yes, and I believe that most men (or women) would. Personally, I believe that this all comes down to the instinct to protect. Laws have been put in place by governing bodies in years gone by to justify or punish actions of a minority but I do not believe that any single law can bound or outweigh a person’s love and loyalty to their family. If it was a case of choosing to protect my children, for example, or obey a law set out by someone who is or was in power at a particular point in our history, telling me whether I am allowed or not to do something, my children would always come first. There’d be no question about that. This all depends on the choices you make throughout your life. If you decide to simply eat, breathe and sleep then you can be considered to be merely alive. If you decide to take chances, follow your dreams and constantly strive to better yourself, then you are truly living. The answer to the question lies in whether you have the desire to make your existence the best that it possibly can be and achieve anything that you want to, or whether you are happy to just let time and space pass you by. Ideas for stories form in my head from anything from movies or TV programmes I watch, pieces of music that I listen to or stories that I read in the news. They sit there until they manifest into something altogether different than how they started out, which then feeds the desire to develop the story on paper. I am driven by the fact that one day my children will look back and hopefully read my books and I am always intrigued by what they will think of them, and whether I will make them proud or inspire them to follow in my footsteps one day. With every new story I write, I also envisage it on screen as a film or TV series, which can also shape some of the plot twists. In ‘Acolyte’, a couple of the chapter endings were written as if they were episodes within a serial drama to give them an almost cliffhanger-style feel. There can be many answers to this question, but I would say that having children is the most joyous and rewarding experience. To me, there is no better reason than that. Your wisdom, experiences, likes, dislikes, dreams and aspirations – everything - can be passed on to your children and they will do what they please with everything that you tell them; they may choose to ignore some of it but some things you say may form the basis for the most important decisions they make in their lives. Knowing that you can have such an impact on another life makes any of the so-called “bad days” of parenting worthwhile. No.5 What was the biggest challenge in creating your book "Acolyte" ? Time, or lack thereof. With each of my books that I have written so far, I have tried to give myself a words-per-day target so that I can try and formulate a plan for when I can likely have it completed by. In terms of structuring my day, I always reserve my one-hour lunch breaks at work for writing if I am working on a new book or short story. On a good day, I can usually achieve around 1600 words within this time, which puts me on track for my target. The problems occur, however, when I run into unexpected events or distractions that take me away from my writing. I beat myself up if I feel that I fall behind, as I try not to let my work encroach on my time at home, meaning that my time is limited. Sometimes, I know that this is not possible, particularly during the editing stages which demands even more of my time, but I am fortunate enough to have been blessed with a very supportive and understanding wife. However, having two young children who are at a magical age, it is a constant struggle to keep the balance between getting my writing complete and spending time with them. It is the age-old problem of not letting your hobby get in the way of your life. To be patient and not to try and second-guess what is around the corner. I always had what I considered to be my life-plan from the time I left school, certain ages that I should have achieved things by (married by twenty-one, father by twenty-five, millionaire by thirty-five, that kind of thing…) but soon realised that things do not happen according to any kind of plan. For example, within seven months of deciding that we wanted to start looking at buying our first house, my wife and I had found a house, gone through the red tape, bought it, moved in and were expecting our first child. Within another three weeks, we found out that we were in fact to be blessed with twins. Even through to my writing career, within a couple of months of finishing writing what was essentially a hobby project, I found myself looking at the possibility of obtaining a publishing deal, turning a small dream into a reality. Subsequently, I try not to ask any questions of my life. I would much rather just live it. No.7 How did you come up with the title "Acolyte" ? It actually came to me whilst I was driving to work one day, during the latter writing stages of the book. I have always found that shorter titles create more intrigue, and wanted to find a word that encapsulated the religious undertones of the book as well as the idea that we – like the characters in the book – all serve a higher power and follow a cause of some kind. Acolyte, in the biblical sense, refers to a person who serves and assists the priest or leader of a religious group, which I believed perfectly summed up the role of one of the central characters. I weep silently in the corner and find a way of writing that person into my next book. Nah, only joking. I like to think that I find the positive in all criticism that I receive and find a way of turning into a strength or improvement for the next project. This is an interesting question because I don’t believe that I have the right to tell people if or why they should read my book over any other. All I will say is that anyone who likes to read something a little different, which is as equally based in history as it is in fiction, which will hopefully help them question not only our existence but the means to our eventual end (with the necessary additional gore), then this may be the book for you. 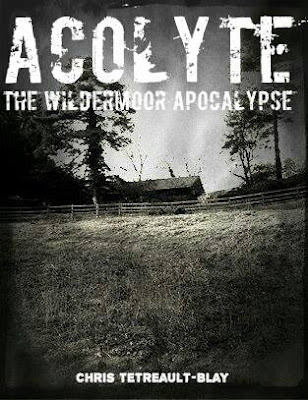 The beauty of ‘Acolyte’ is that it is only the beginning – the rest of The Wildermoor Apocalypse still has a hell of a story to tell. Because if there was nothing, we would have nothing to lose. Which inturn would breed uncertainty of values. Which in turn would breed chaos. What an intriguing question though! Meet Colin Dexter a man plagued by visions of a monster. He turns to a priest for help but the priest is not who he seems. An old man hunts for his daughter Evelyn, who was abducted in the middle of the night. Detective Truman's life is turned upside down when Dexler makes a fatal decision. What connects these people over hundreds of years? Who will unlock the secret? Something is coming. Something big. And light must face darkness.